Anyone who knows me well knows that for years I have struggled with my frizzy and curly hair, spending many a morning straightening and eventually tying it back in frustration. Yet how many people over my lifetime have told me they’d kill for my curls? Lots! It’s silly isn’t it? We are born with what we have, yet we spend a lot of time wishing we had something different rather than embracing and loving who we are, our individuality and the physical features that come with that. I think this is such an important message to pass on to young children. We spend so much time trying to look like everyone else, trying to fit in, rather than loving who we are as we are, and yet when and if we do finally learn this, how freeing and empowering it feels! 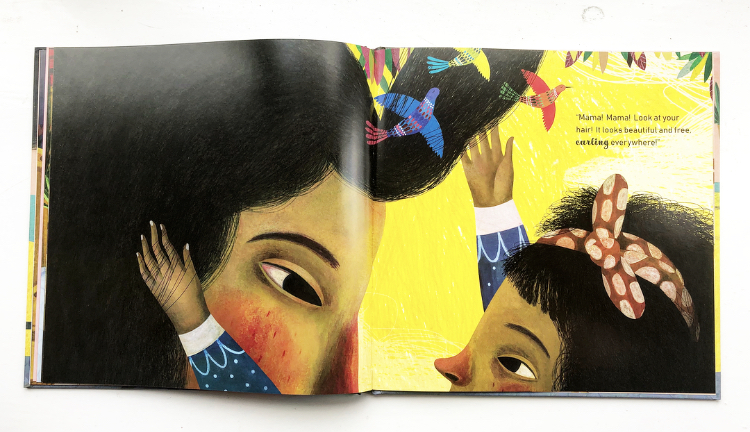 Mira’s Curly Hair written by Maryam al Serkal, illustrated by Rebeca Luciani and published by Lantana Publishing get this message across in the most endearing and inclusive way I have seen. 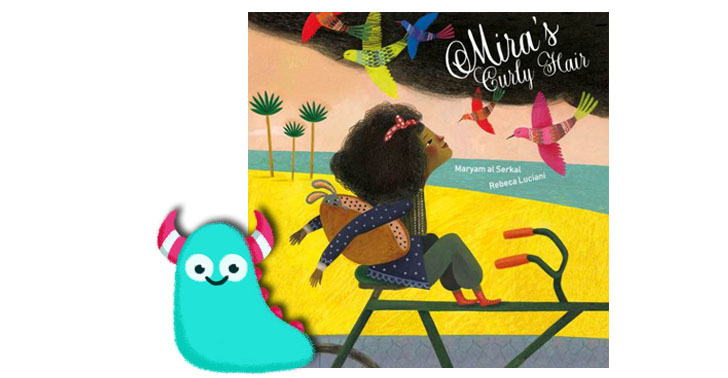 Mira’s Curly Hair is set in the Emirates and follows Mira, a curly haired little girl who wishes her hair was straight and smooth, and the opposite to what she has. Her mother has straight smooth hair, and Mira wants to be just like her. But when they both go out for a walk one day and the rain starts to fall, Mira soon discovers her Mother’s natural beauty in her own big, curly hair, and she realises how wonderful it really is. Both Mira and her mother learn to embrace their natural feature and love themselves just as they are. This is such a heartwarming story and one that I know children like me would learn an awful lot from. We spend so much time as adults tweaking and finessing our outer appearance to fit in, or look how we think we want, it’s easy to forget that our natural uniqueness and beauty can be what shines out about us, or even that it doesn’t actually matter all that much, that living in the moment and enjoying our life is far more important. If we don’t show our children self acceptance and love through our actions, how on earth can we expect them to do the same? Mira’s mother learns this by complete accident, but this wonderful story encourages us to not make the same mistakes. this is a beautifully written story by Maryam, the sentences are short and scarce, but clearly very well thought out as they have a gentle relaxed rhyme in certain spots, quirky little phrases that do not over express the point being made. With this lovely simplicity comes a clear understanding of the point of the story, whilst also allowing for interpretation of your own. It’s really quite special, and incredibly clever writing. Rebeca’s illustrations work hand in hand with this pure poetry to tell the story in a truly enchantingly visual way. You get a wonderful sense of the setting and characters in the story. Mira in particular stands out with so much expression on her face showing a strong and independent, yet devoted little girl. 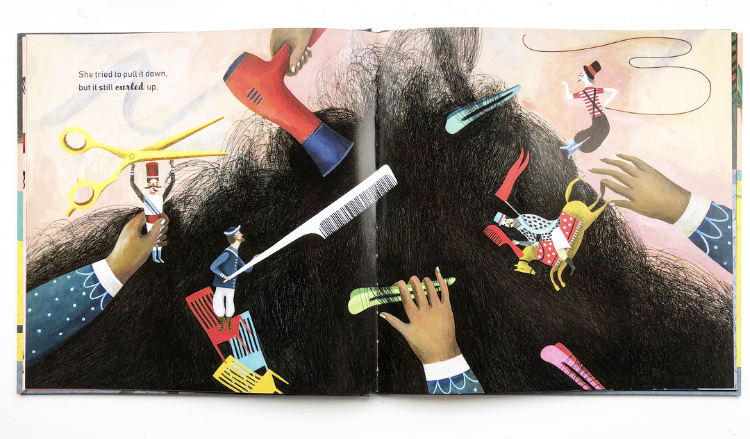 The illustrations are full of texture, vivid and bright adding interest for children, yet when the rainstorm that curls Mira’s mother’s hair arrives, you really feel like you can taste the damp in the air, and the darkness looming over you, the atmosphere pops out from the pages of this book brilliantly. 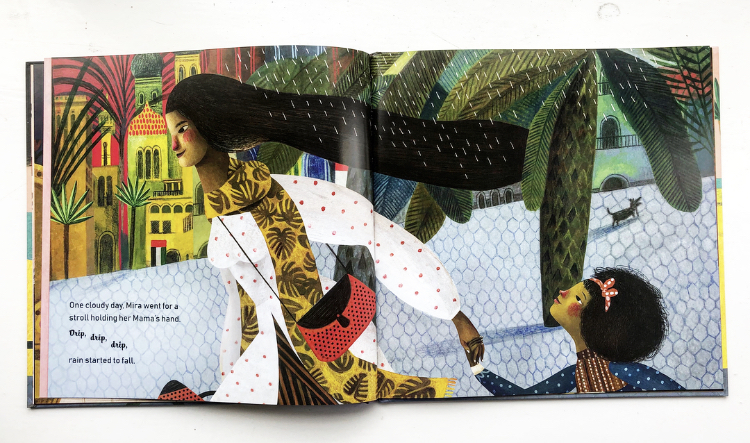 It is so apparent from the beautiful words and images here how much Mira admires and looks up to her mother, following diligently in her footsteps, like many children do, wanting to be just like them. Whoever the role model in a child’s life, we have a responsibility to set an example to them and help them learn to love themselves from a young age. In this world of social media, selfies, and articles that promote what others want us to believe we should look like, reading stories to children that promote the exact opposite are all the more important. 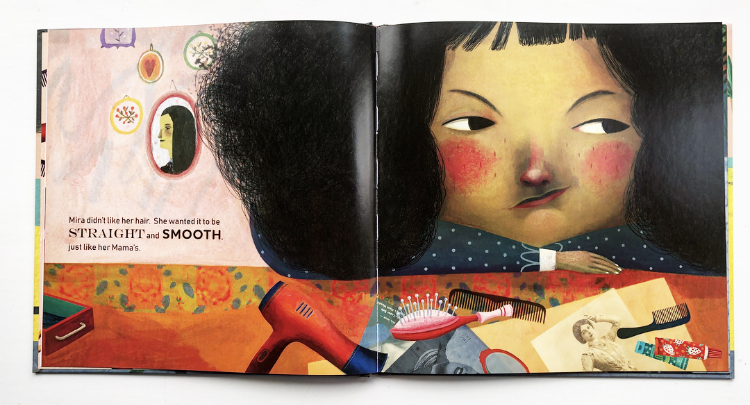 Books that feature children who may not always be represented in stories, books that embrace their natural beauty and their inner beauty too, books exactly like Mira’s Curly Hair! 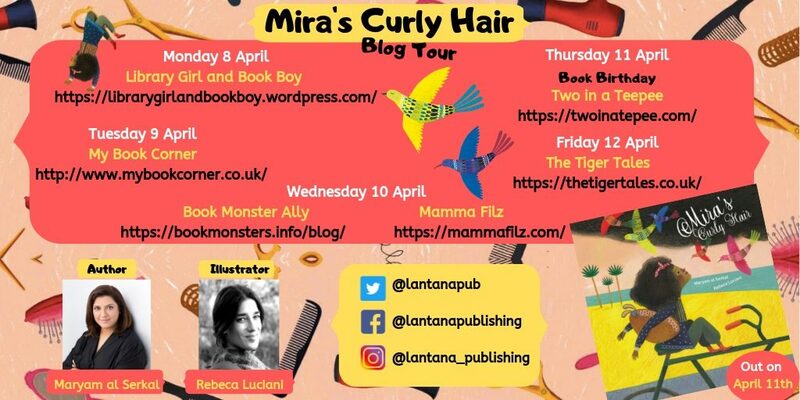 Mira’s Curly Hair is available, April 11th 2019, from all good libraries and book shops. Thank you to Lantana for sending me a copy of this book for the blog, and thank you for reading this curly Book Monster review.